NasCarts is a golf cart sales and services company based in Jacksonville, Nocatee, Florida that specializes in golf cart repair, refurbishment, upgrade and replacement options for your new or used golf cart. NasCarts is a family owned golf cart store bringing our families the best in custom golf cart designs, service & experience. Check out our latest builds! NasCarts is a custom golf cart sales, repair and upgrade company based in Jacksonville, Florida that specializes in golf cart repair and golf cart replacements. We offer fully customizable options ranging from golf cart custom seats, light kits, audio systems, rim and tire packages, battery replacement and other parts for your new or existing golf cart. NasCarts has been proudly serving the Nocatee, Jacksonville and Saint Augustine, FL and surrounding areas with over 15 years combined experience servicing new and used Golf Carts. NasCarts provides purchasing options, starting from a base model to the most customized cart we offer. Our golf carts are great for transportation around your neighborhood, from the driving range to the 18th hole of your favorite golf course. Our staff has experience in sales and servicing Club Car™, RXV, TXT and Yamaha™ brand named golf carts. We now have custom vinyl seating options to further customize your golf cart needs. 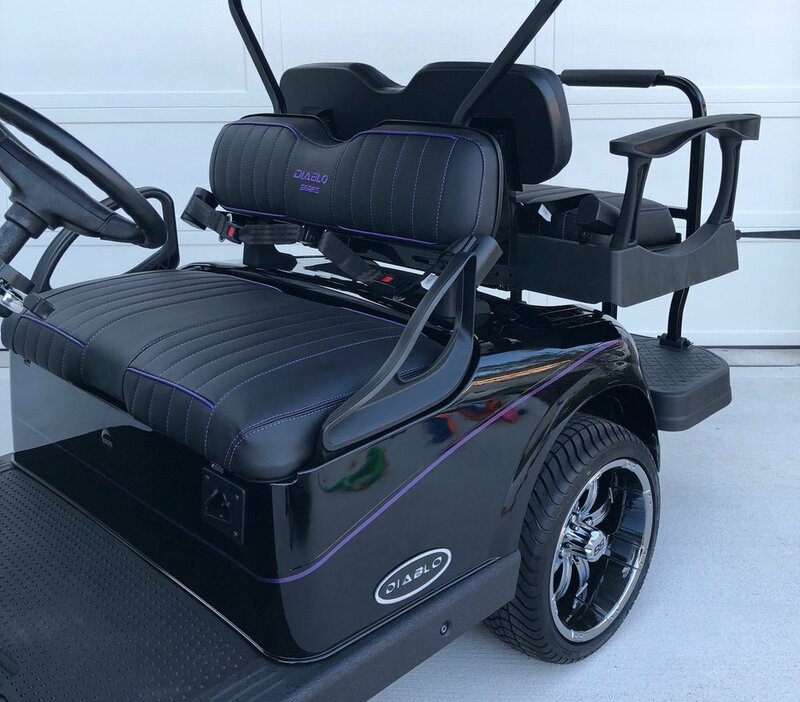 Stylize your golf cart seating with multiple colored schemes or add a "themed" patch on both your passenger and rear view seating. Whether it is your favorite sports team or your company name, we can apply your decal or provide custom designed lettering services for your customized golf cart. Nascarts in Ponte Vedra, Nocatee, Jacksonville, FL provides lifted golf carts kits for new or used golf carts. Our lift kits allows opens the possibilities for larger tires, suspension and tread options that match your needs. Let us install, customize your optionsyour lift kit for your new or used golf cart. Please contact us regarding your custom lift kit needs. We can service, customize, repair and specialize in all makes/models golf carts to enhance your golf cart. *Subject to credit approval. Some restrictions may apply. Ask for details. Every golf course experience is enriched with your full customized golf cart. We pride ourselves by providing the best customer service with golf cart repair, parts and custom upgradable options. At NasCarts all carts are not built alike. We pride ourselves in using OEM (original equipment manufacturer) parts. We start the customization of your custom golf cart the way you want it built.